A good translation can make or break a book. It’s entirely possible for an exquisite novel to be perceived as lacking, inaccesible, or plain not good enough when translated into another language. 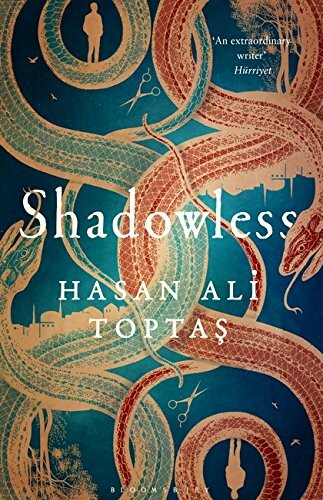 Thankfully, this is not the case with Shadowless by Hasan Ali Toptas, arguably one of the most important writers of contemporary Turkish literature. Translated by Maureen Freely and John Angliss, Shadowless is a postmodern work that can only be described as an enigma. The novel, at first glance, seems to be about dissappearences. But if you were to delve deeper into the book, you’d find that this is not the case at all. Though the plot of the novel does center around the dissappearance of one specific person, what lies at its core is the materiality of existence and what that really means. Shadowless recounts the dissappearance of Guvercin (Dove) from the rural, nameless, Anatolian village she lives in with her parents. Despite the efforts of her family and everyone in the village, no one can find a single clue as to where Guvercin dissappeared to. What’s more, as time goes by it seems no one, not even her father, is able to recall what she looked like. Despite Guvercin’s father’s desperate search for her daughter which goes on day after day after day, it’s as if Guvercin is wiped from the collective memory of the village. It’s as if she never existed at all. Interestingly enough, this is not the only time someone dissappeared from the village in such a manner. An array of people have dissappeared from the village in the past and while some such as Nuri, a local character, have resurfaced in the years to come others, such as a horde of kids, have not. It is easy to think that these characters are somehow wiped from existence in the village. But that would imply that the village which in essence is stuck in time existed at all. Blending dream, reality, and memory seemlessly, Shadowless weaves a narrative that can be interpreted in many ways. The dreamlike and poetic narrative structure is therefore open to many forms of interpretation. One such interpretation, therefore, is that the village doesn’t exist in time and space as we know it and that the characters that “dissappear,” losing even their shadows; the only proof to their materiality, only do so when they begin to truly exist. This would serve to explain why certain characters such as Nuri suddenly find themselves in the barbershop in Istanbul, the novel’s second location, with no real recollection of their immediate pasts. This would also explain why other characters, like the apprentice from the barbarshop, dissappear from Istanbul, only to find their way to the village. These characters’ reappearance in the village then would imply they’ve once again ceased to exist, in another sense. What then does existence mean? Is it existence in the physical, material sense? Is it in a more metaphorical sense, implying that existence and dissappearance relate to the importance of these characters in relation the rest of the world and to their isolation from it? Or is it in a metaphyscial, even religious sense affixing the village in a timeless purgatory perceived by the reader only through a dream-fever narrative that only some characters escape from. The beauty of Shadowless is that it can be all of these things and that it can be none of these things. The hallucinogenic, uncertain, and mysterious quality of the narrative may simply be a device to reflect the confusion, desperation, and panic that the characters in the village, from Guvercin’s father to the village mukthar feel. If so, the narrative serves to drive the reader forward in the story, adamant in untangling the knot of the plot to discover what really happened to Guvercin. Was she abducted? Did she run away? Or was she erased from the reality of this bizzare place? As with many postmodernist works and works of poetry which this novel curiously resembles, the choice is the reader’s to make.